Ok, so… the title. Sometimes you see it as Alice in Wonderland and sometimes you see it as Alice’s Adventures in Wonderland. I believe the original is Alice’s Adventures in Wonderland, and in time it was shortened. (Which is the way I normally say it.) Either way you go, this classic of children’s literature is known around the world and continues to be referenced in music, TV and pretty much every facet of life. I read this book aloud to my boys years ago as part of our Home Schooling. My daughter never cared much for being read to, but my boys had more endurance for sitting and listening to longer, more involved stories. So about the time that we were transitioning from storybooks to chapter books, Alice turned up on our reading list. We enjoyed it immensely! The boys were interested and engaged and they were too young to be offended by my singing voice when we got to the The Lobster Quadrille, when the Mock Turtle sang, because, you know, I sang it too. Another great memory from the book for us was the Mad Hatter Tea Party. With the table all set for tea, the Mad Hatter suggests that they rotate around the table while enjoying their tea. But he arranged it so that only he was the one moving to a fresh cup of tea at each turn, and the others had to follow along and sample tea from cups that someone had already drank from. That scoundrel! We set up our own tea table at home to demonstrate. All in all, we thoroughly enjoyed Alice in Wonderland. But it’s strange, I did not feel the same about Through the Looking Glass. No doubt this had everything to do with the fact that I was reading Through the Looking Glass while we were traveling to and from Atlanta, with a car load of our people, and I was also reading The Turn of the Screw by Henry James, Bad Twin by Gary Troup and four other books. So even though, according to my book journal, that was the most productive reading month I have had in the last three years, I simply had no patience for the nonsensical madness that is Through The Looking Glass. When I read Wonderland to the boys, it was a library book. When I read Looking Glass it was on my brand new Kindle. 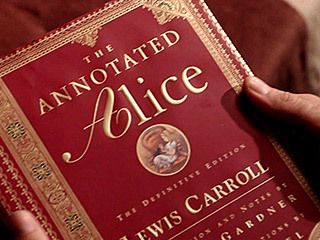 But because Alice is referenced often in LOST, I really wanted to have my own hard copy for my bookshelf. I perused a bazillion copies in bookstores and just couldn’t find one I really liked. So I decided to purchase the one that is featured in LOST, season six. Isn’t is gorgeous? It looks great on the shelf too. And you know how these annotated versions go, there is more info about Carroll and these stories than I’ll ever need to know. Perhaps I’ll have a new study focus when this challenge is over. Well, things get Alice-y pretty quickly on the island. In the episode “White Rabbit”, Jack sees a vision of his dead father walking around and he begins to chase it. John tells him it’s his White Rabbit, like the rabbit in Wonderland that Alice chases into the hole. This all occurs at the beginning of the show’s story and sets the mood for mystery and other unknowns. Jack is also seen reading the book aloud to Aaron in an off-island scene which is also strange, since Jack has made it clear that he is not the “Father” type. (Jack is one of almost ALL the characters on the show that has major Daddy issues.) Daddy issues are one of the many themes of LOST. Much later in Season 6, Jack is seen discussing this book with his…DUN DUN DUN….teenaged son. Season Three brought us the episode entitled Through the Looking Glass. The Looking Glass was an underwater science station that used to be run by the Dharma Initiative. There was some bad and sad stuff that happened down there that I can’t bring myself to talk about here. But a heart wrenching, edge-of-your-seat, last minute, sacrificial act proved to be what saved the LOSTies. (At least until their next life threatening island ordeal). ← My First Blogoversary and a Giveaway!!! I’ve never read Alice in Wonderland. Somehow I went straight from Nancy Drew to adult fiction at around 11 years old, with nothing in between. My parents had no idea what I was reading! They didn’t care. Just happy I was reading. Lately, I have been toying with the idea of going back and reading some childhood classics, like this and Charlotte’s Web. It is on Netflix, you should give it a shot. LOST is a show that loves literature. :) And make sure that if you watch it, you always watch it in order. I’d love to chat with you about it if you do decide to watch. Obviously, it’s one of my favorite subjects. I know it’s not your favorite, but there is an annotated Charlotte’s Web that I would love to have. What a gorgeous-looking book. I’ll keep an eye out for this; I love anything Alice! I just couldn’t get this version of it out of my head when I was looking around so I just bought this one. It’s a nice keepsake edition. I am drooling over that annotated hard-copy. I love both the books and I love how you’ve read the entire book to your kids. It sounds like so much fun! We did have a lot of fun reading it. I remember either having a copy as a child or watching it on TV, but I don’t remember reading it or it being read to me. Thankfully my boys tolerated strange or silly stories really well when they were younger. I remember them also liking My Father’s Dragon.